IRM Roofing is a small, intimate but very experienced industrial roofing company based in Walsall. 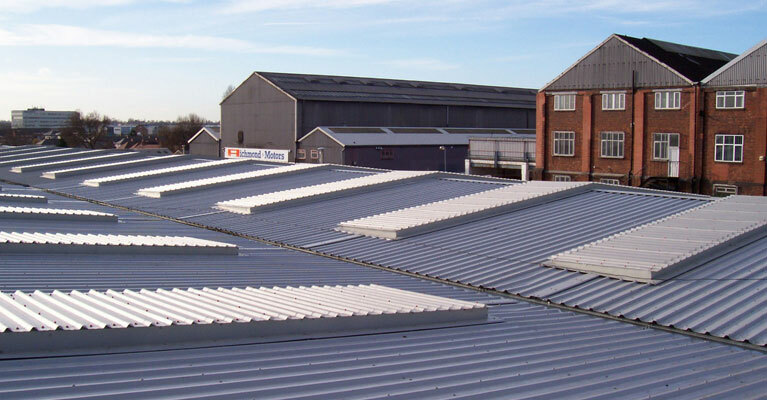 Established in 2002, we specialise in all aspects of industrial roofing and cladding. 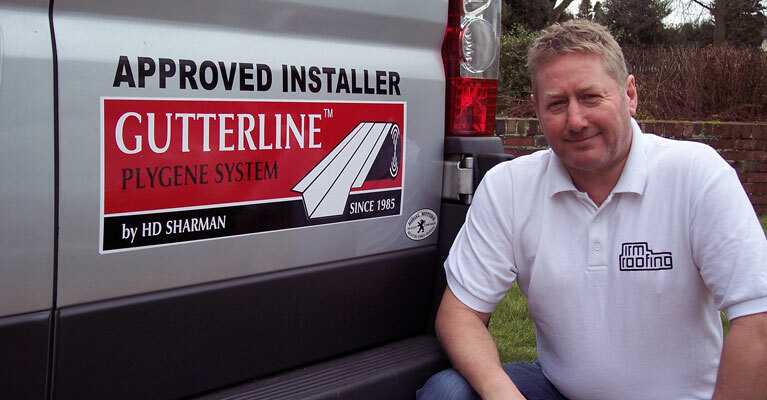 We are Plygene Gutterline approved installers and also Giromax approved installers. 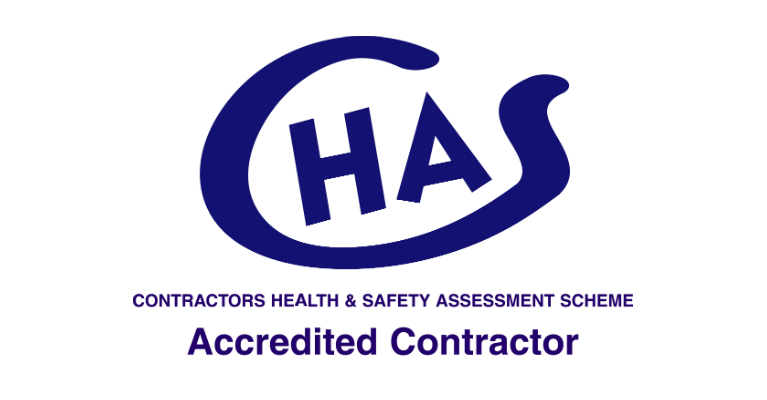 As a Chas Accredited Contractor we serve commercial customers all over the West Midlands and out across the UK. Industrial Roofing and Maintenance Ltd was established in 2002 by our owner Andy Smith, who has over thirty years worth of experience in industrial roofing. 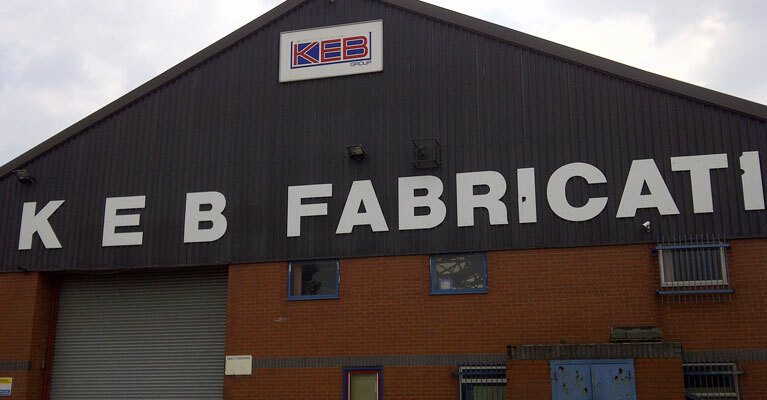 We are a small, intimate but very experienced industrial roofing company based in Walsall, specialising in all aspects of industrial roofing and cladding, serving commercial customers all over the West Midlands and out across the United Kingdom. With all appropriate certificates and insurances in place, together with all aspects of health and safety adhered to through the use of independent safety advisors, our customers can be assured of a trusting service carried out to the highest standards. We are 'Contractors Health and Safety Assessment Scheme Accredited' (CHAS) and our customer focus has led to a portfolio of long standing business relationships. Our mission is simple. Provide customers with a highly experienced, highly skilled, organised and efficient service at very competitive prices. Then add that personal touch that national suppliers just cannot do. As a Plygene approved installer, Giromax end lap corrosion approved applicator and a Uniclad systems approved contractor, we can also supply those specialist products when required. Plygene Gutterline is a proven hardwearing gutter lining solution. BBA Certified together with a twenty year guarantee, Plygene Gutterline is pliable enough to mould to any gutter profile and will tolerate changes in temperatures and building movement without splitting or cracking. 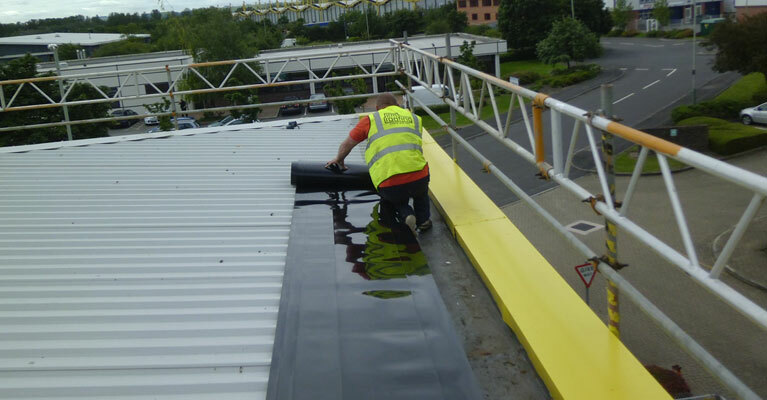 As Plygene approved installers and experts in gutter maintenance, refurbishment and repair, Industrial Roofing in Walsall use Plygene Gutterline as our product of choice. 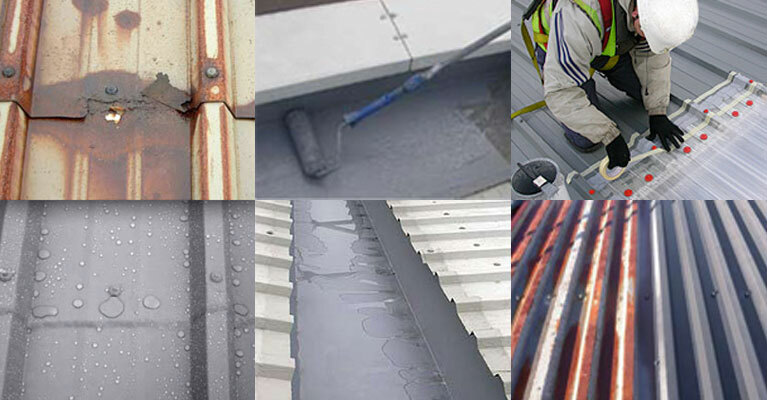 Giromax are the UK and European supplier of Delcote and Seamsil silicone systems, the most effective UV and corrosion resistant coatings available for the refurbishment of commercial roofing and cladding. As Giromax approved installers, Industrial Roofing in Walsall supply and install the full range of Giromax products, including Delcote silicone coating, Seamsil silicone remedial system, Delcote HPG elastomeric membrane and Delglaze aliphatic polyurethane. Industrial Roofing in Walsall installed a Plygene Gutterline System with cut edge corrosion treatment using Giromax Seamsil in Gloucester at PJE Business Solutions. The plygene gutterline system involved all aspects - truncated welded outlets, welded corners and T junctions, and the cut edge corrosion was treated with Giromax seamsil (both carry 10-15 year guarantees). "We have used IRM Roofing on many projects over the last few years and have found their work to be competitive, thorough and responsive to our time scales. I have no hesitation in recommending Andy and his team." Neglecting gutters can lead to all sorts of problems including blocked outlets, overflow and leaks (potentially damaging equipment and stock). Gutter maintenance once every six months or annually can help avoid these sometimes catastrophic and costly events. 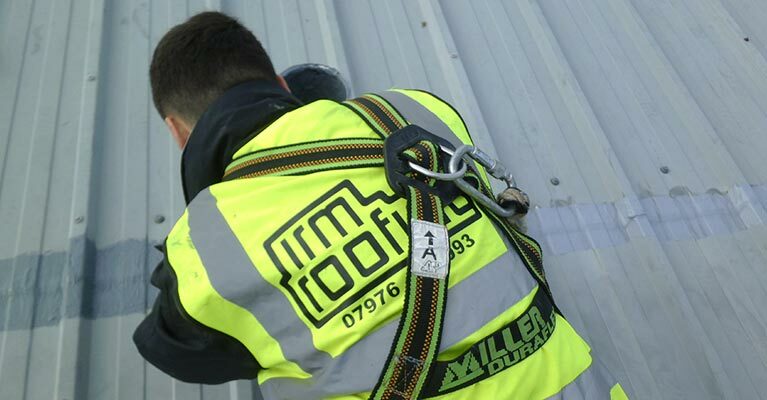 If you require gutter refurbishment, gutter repairs, gutter replacement or gutter maintenance in Walsall / beyond then please don't hesitate to contact us at Industrial Roofing and Maintenance. We are here to help. Wall cladding and vertical cladding provide old buildings with a fresh new look. As Uniclad Systems approved installers, Industrial Roofing and Maintenance supply, install and replace all types of cladding systems to suit your requirements, including single skin, double skin, composite panels and overlay systems. 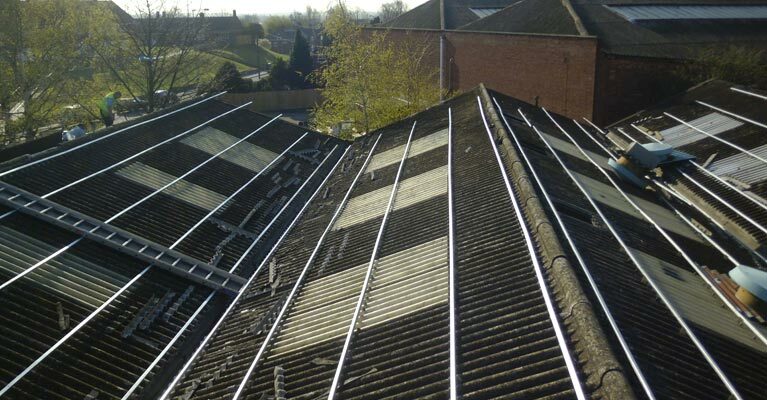 Asbestos roofing is made up from asbestos cement and asbestos fibres, and is still present on many old buildings across the UK. Over time, problems arise through hook bolts seals perishing, asbestos roof sheets cracking, and live vegetation eating through the asbestos roof sheets. Industrial Roofing and Maintenance Ltd are certified to refurbish and repair asbestos roofing, as well as manage the removal of old asbestos roofing ready for the installation of new industrial roofing in its place. Composite roofing comprises of an inner liner sheet and an outer corrugated roofing panel with an insulated core, all in one composite panel. 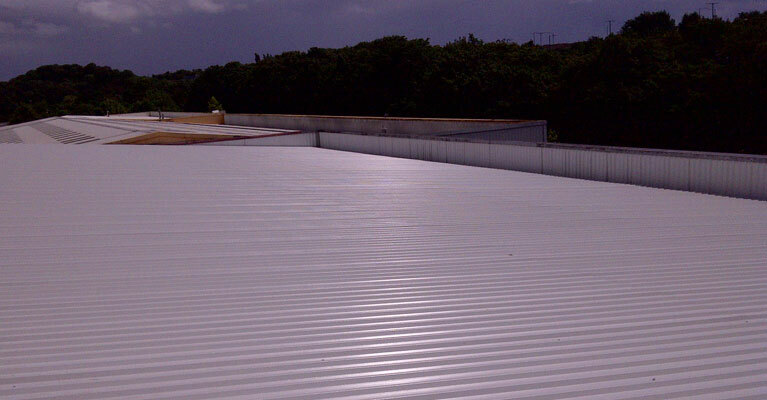 It is a modern industrial roofing system gaining in popularity year on year, especially as the likes of old asbestos roofing becomes dilapodated through time. As a composite industrial roofing installer in Walsall, our product of choice is Kingspan composite roof and wall panels (for which we supply, install, refurbish, repair and replace). 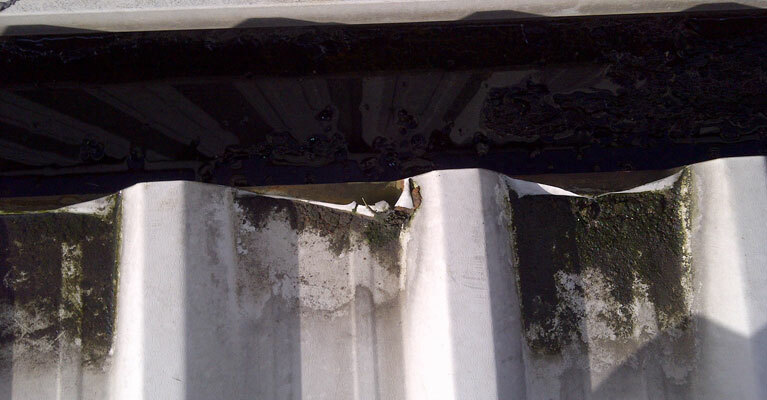 The corrosion of metal profile roofing is something most commercial buildings will have to deal with at some point. Corrosion usually begins as edge peel at the end laps through weathering and moves on from there. 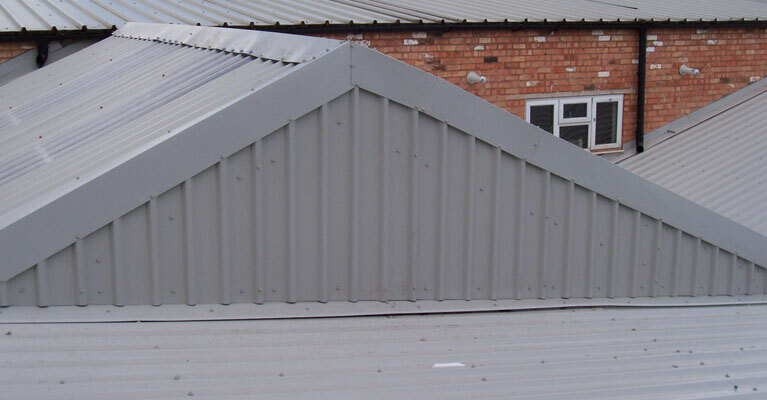 Industrial roofing in Walsall supply, install and replace all types of metal profile roofing, from corrugated steel roofing sheets to tile effect roofing sheets. And as Giromax approved installers we are experts at the refurbishment and repair of existing metal profile roofing. 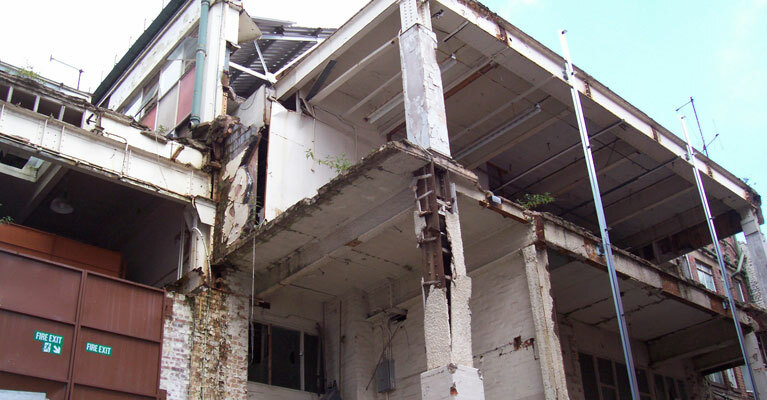 Dilapidation works are common on commercial building roofs, whether they are built from metal profile roofing, asbestos roofing or composite roofing. Refurbishment and repair is often carried out through the use of roof coating systems. 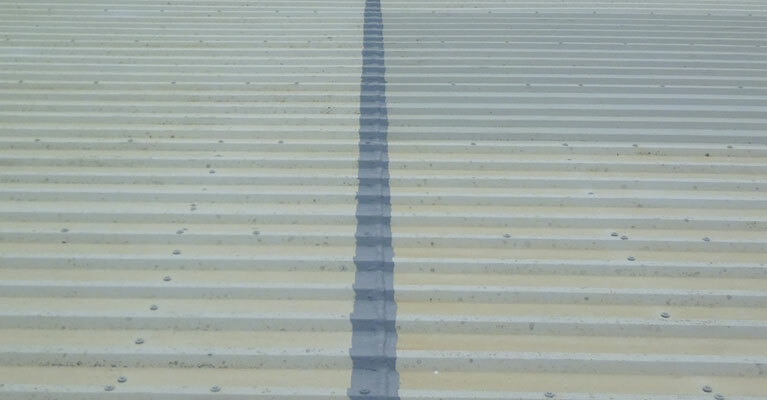 At Industrial Roofing in Walsall, we specialise in applying roof coating systems, and our product of choice is Giromax. As corrosion specialists and approved Giromax applicators, we use Giromax Seamsil and Giromax Delcote to transform old dilapidated roofs. Roof skylights are often referred to as roof lights, and their sole purpose is to allow daylight to shine through the roof into a building, helping to save on lighting costs. Over time they can discolour, warp and break. Even skylight fixings can work loose over time. At Industrial Roofing in Walsall, we supply and install new skylights as well refurbish, repair and replace existing skylights (including asbestos roof skylights, steel roof skylights and step safe skylights). 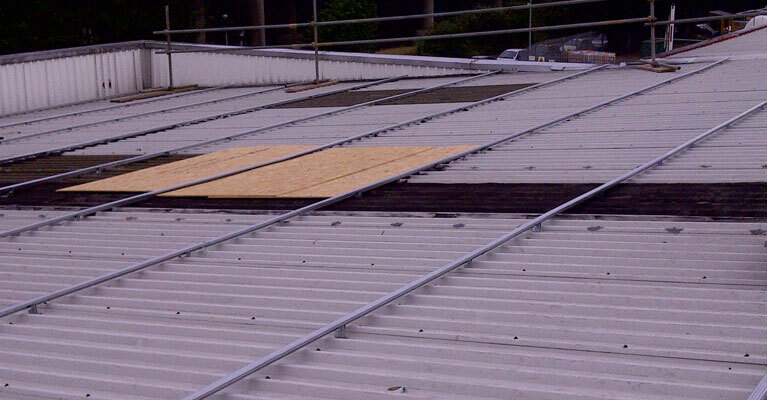 IRM Roofing was tasked to overclad the office area at Space 4 in Birmingham, to make water tight for refurbishment. The work was carried out by a team of four over a two week period, and a Plygene gutter was also installed. 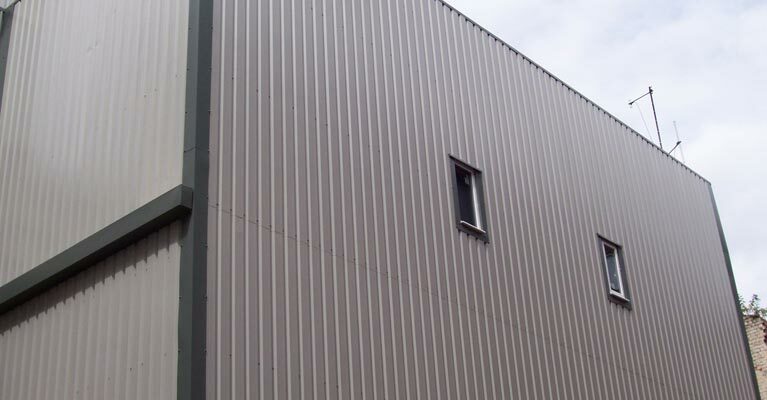 Industrial Roofing and Maintenance were instructed by a Birmingham property developer to turn a derelict property into a practical working space, through the installation of wall cladding, over a three week period. This old disused factory unit was converted into a modern luxury conference center. Our task was to give the building a modern look through installing Kingspan composite wall panels to the outer walls of the building. First, please confirm you are not a robot.